Slicing, dicing and mincing are the three things that a santoku does exceptionally well. 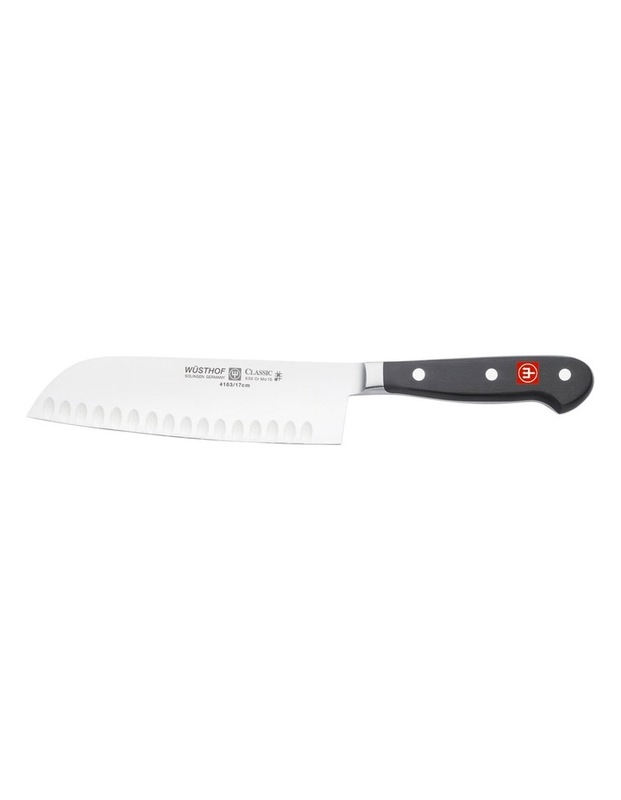 This knife's hollow edge also reduces friction so that the cook can work more speedily and efficiently. The future of German cutlery is Wusthof Ikon. Never before has the humble kitchen knife been so thoroughly reconsidered. Every aspect of the Ikon line, from blade to bolster to handle, has been redesigned to maximize comfort, ease, and enjoyment in the kitchen. Wusthof Ikon's most significant enhancement is the precision bolster, shortened to allow sharpening of the entire blade and swept back to conform to the natural shape of your fingers. Blades are ground thin to reduce resistance while cutting and are finished with an ultra-sharp polished edge. Knife Makers to the World Since 1814, Wusthof is a true classic in the culinary world. Wusthof knives are forged from single blanks of X50CrMoVa15 surgical stainless steel, finished through a 38-step process, and thoroughly inspected at every stage to ensure each knife is flawless. Wusthof knives are hand-crafted in Solingen, Germany. The Trident logo stands for form, function and uncompromising quality. Wusthof stands behind their products with one of the most lenient lifetime guarantees available.